Dr. Nguyen Thi My Dung joined Cao Thang Eye Hospital (CTEH) in 2002 as senior consultant and Phaco surgeon. In 2015 she was named Head of Glaucoma. In this role, she builds and organizes the quality assurance and medical protocols for the department. Prior to joining CTEH, Dr. Dung was senior consultant and cataract surgeon at Cho Ray Hospital, Ho Chi Minh City, Vietnam, from 1989 – 2011. She also taught for nine years at the HCMC University of Medicine and Pharmacy, lecturing mostly in post-graduate ophthalmology courses. In 1985 Dr. Dung conducted a study of bacteria in corneal ulcers. In 2000, she carried out research on non-penetrating trabeculectomy surgery for primary open angle glaucoma. 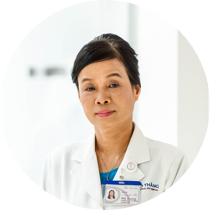 Dr. Dung obtained her Medical Doctor Degree and Specialist Level 1 (equivalent to Master in Ophthalmology) from the HCMC University of Medicine and Pharmacy in 1981 and 2001, respectively. She also received a Postdoctoral level 2 in Ophthalmology from the same institution. Always striving to improve her skills, Dr. Dung has taken numerous courses and certificates including: Certificate of Didactic and Surgical accreditation of Visian ICL; Certificate of Phaco surgery at Cho Ray Hospital; Certificate of Hospital Management at Pham Ngoc Thach University of Medicine; Certificate of Intermediate Phacoemulsification course at Singapore National Eye Centre (SNEC); and many more. Dr. Dung is a member of the HCMC Ophthalmological Society, and of the Asia-Pacific Glaucoma Society (APGS). • The 20th Annual meeting of the Asia-Pacific Association of Cataract and Refractive Surgeons (APACRS), 2007, Hanoi, Vietnam. • APAO 2003, Bangkok, Thailand. • Apodized Diffractive IOL Symposia in September, 2007. • AEC Post Graduate Seminar on Glaucoma and Diabetic Retinopathy within the AEC Collaborative Ophthalmic Training Program fo S.R. Vietnam in April, 2010. • The 2rd Joint Symposium Vitreo-Retina Subspecialty of the Vietnamese American Ophthalmology Symposium (VAOS) in HCMC, Vietnam in November, 2011. • The 3rd Joint Symposium Vitreo-Retina Subspecialty of the Vietnamese American Ophthalmology Symposium (VAOS) in HCMC, Vietnam in February, 2012. • NHG Eye Institute – The 6th International Ophthalmology Congress with topic “Advances in Vitreo-Retina”, Singapore in October, 2013.